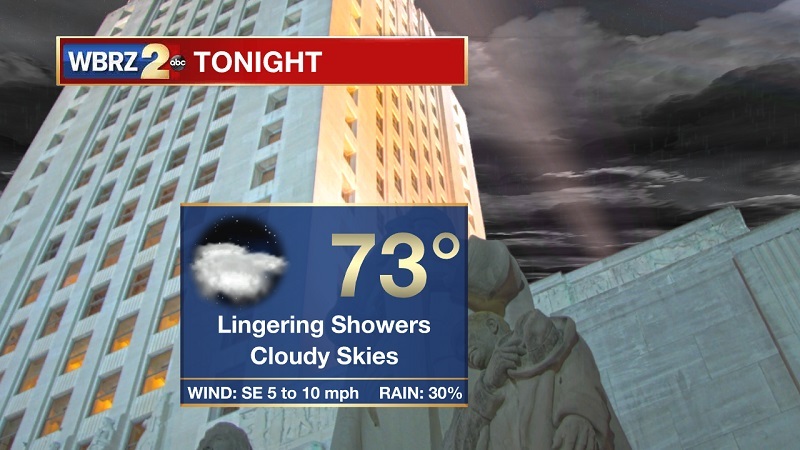 Tonight and Tomorrow: Spotty showers and an isolated storm or two are possible through the evening and into the overnight period, as southeast winds continue to bring moisture onshore. Temperatures will drop to around 73° late, with dewpoints hovering around the low 70s as well. Another wet day on tap for your Labor Day, as morning spotty showers will lead to afternoon storms until 8 PM. Area of drizzle should linger late, but the downpours should be confined to the hours of 1 PM and 8 PM. Temperatures should be warmer, eventually reaching around 87°. Up Next: This wet spell continues, and slowly intensifies as a tropical system approaches the Gulf Coast from Southern Florida. 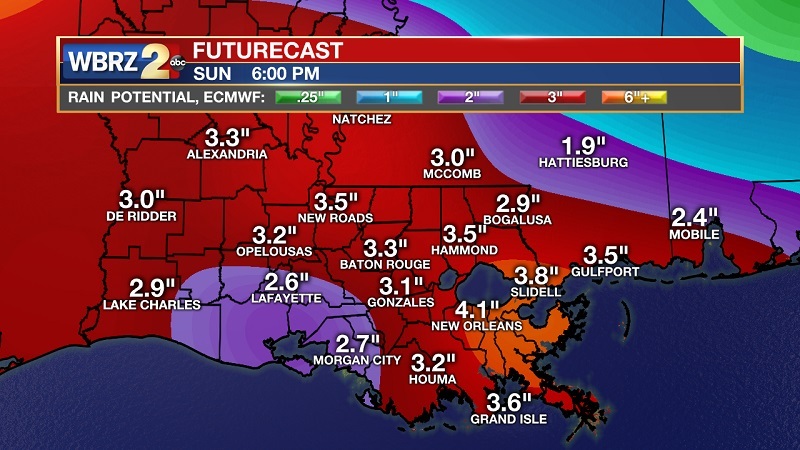 Enhanced downpours and increasing winds from the southeast will allow for downed trees, as an additional 2-5 inches of rainfall is possible through Thursday. Conditions begin to slowly dry out as we proceed into next weekend. 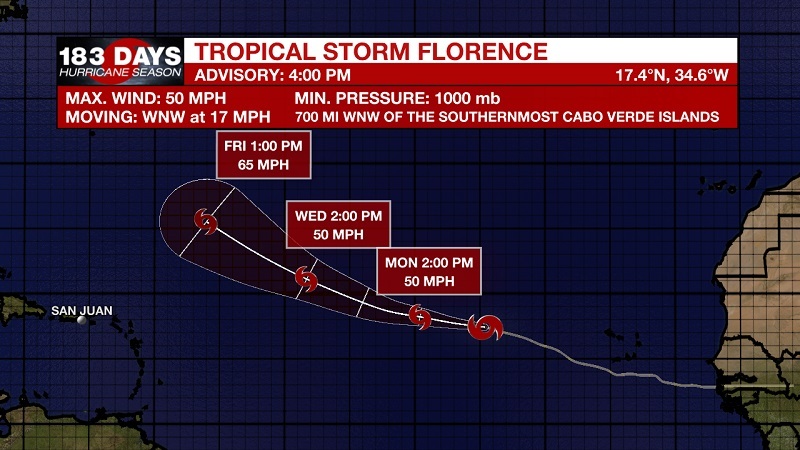 Tropical Storm Florence is continuing to spin in the Eastern Atlantic, about 700 miles west-northwest of the Cabo Verde Islands. Sustained winds are at 50 mph, and is moving WNW at 17 mph. General motion through Tuesday should continue toward the WNW, with little change in strength forecast during the next few days. Storm activity associated with a tropical wave between Cuba and the Bahamas is slowly becoming more organized, as upper-level winds are becoming more favorable. A tropical depression is likely to form during the next day or so while the system moves west-northwestward across the northwestern Bahamas, southern Florida, and the Florida Keys. 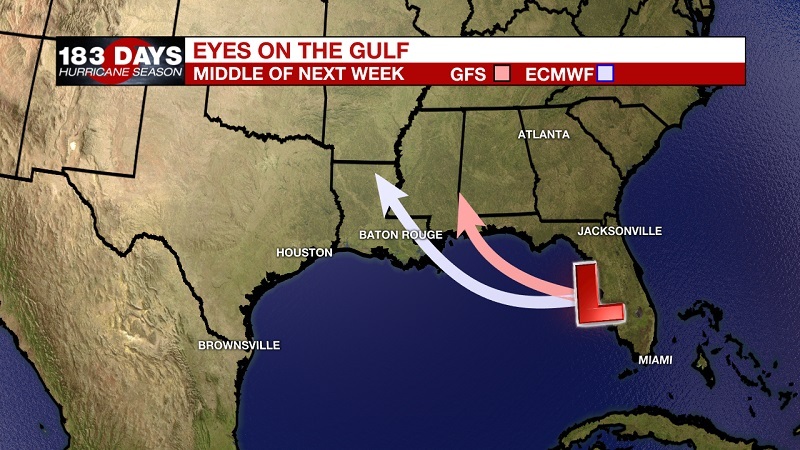 The system is forecast to emerge over the southeastern Gulf of Mexico Monday afternoon, moving toward the north-central Gulf Coast Tuesday night and Wednesday. 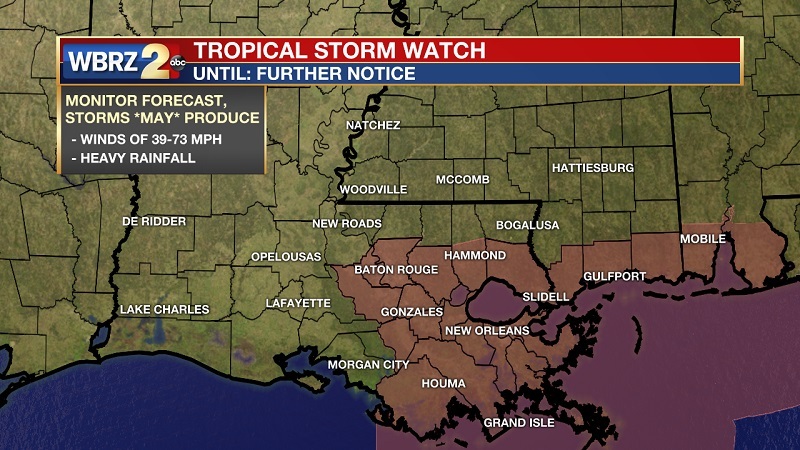 A tropical storm watch is in affect from the Alabama/Florida border west to Morgan City, Louisiana. An Air Force reconnaissance aircraft is scheduled to investigate this system on Monday. The National Hurricane Center is expecting this to become tropical over the next couple days, with a 70% with 48 hours and 90% within the next 5 days. A tropical wave is also located along the west coast of Africa, and is forecast to move westward over the far eastern tropical Atlantic for the next several days. Upper-level winds are expected to gradually become more conducive for some slow development of this disturbance by the middle of the week. 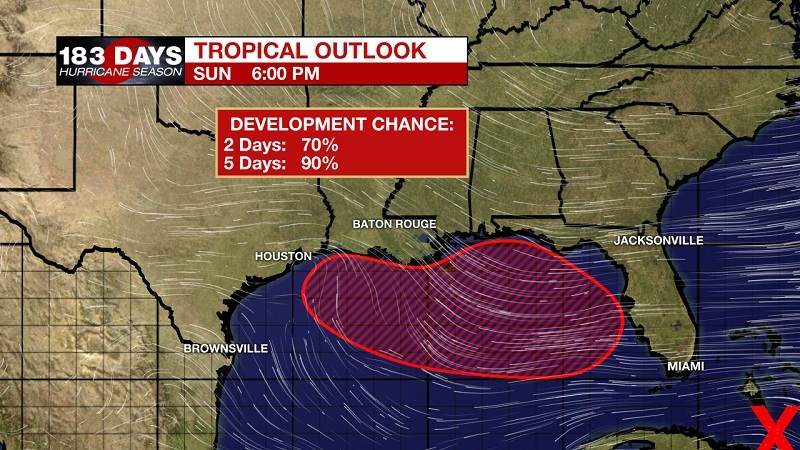 The National Hurricane Center is forecasting a low probability of development, with a 20% chance within the next 5 days. The high pressure and low pressure that were focusing onshore flow on Saturday have now retreated toward the northeast and southwest respectively. This has provided a small channel that has confined the majority of showers northeast and southwest of Baton Rouge. The low pressure will return from the southwest into Monday, bringing scattered showers back into the mix through the afternoon hours. The tropical wave that is currently north of Cuba is forecast to develop tropical characteristics over the next 24 to 48 hours, as it travels through South Florida and into the Gulf. There, it will move over warmer water and less upper-level wind shear, which will aid in development and intensification. Models are still unsure about intensity, and have actually dropped off a bit over the last 24 hours, but the National Hurricane Center is suggesting intensification to tropical storm status by Tuesday. Regardless of landfall location, the system should move north quickly and eventually toward the northeast over the weekend. This will help to allow for the return to afternoon, isolated showers Saturday and Sunday.